There is no such thing as the perfect resume, but half of employers will agree and half will not. Employers have their own unique likes and dislikes when it comes to resume formatting, so there is no secret resume-writing formula that automatically guarantees success. A resume must be at least one full page in length. Two pages is acceptable for highly accomplished and experienced candidates, but more than two pages will more than likely leave your resume unread. A resume should always be accompanied by a cover letter. A cover letter should never exceed one page. Half a page to 3/4 is acceptable. Cover letters should have three or four paragraphs: The Introduction should tell the reader the purpose of the correspondence; the Body should explain your experiences and skills; and the Conclusion should summarize and request an interview. You can split the Body into two paragraphs if you wish: the top for work experience and the bottom for a summary of skills. You can also mix it up a bit and do one paragraph for experience, one for education (if necessary to your profession), and incorporate your summary of skills into the Conclusion. Cover letters are important for inexperienced candidates because they prove skills and enthusiasm to potential employers. A cover letter briefly addresses "who you are" and "what you want"; highlights your most relevant experience and skills; tells employers what you can do for them; and addresses any "red flags" that will be raised by your resume. Never hesitate to ask a professional resume writer any questions that you may have. A professional opinion can only assist you in your writing and job search. Utilize resources such as resume books, samples, and writing tips to make your resume look as good as possible. Research potential employers and their company's positions you are going to apply for so that you can tailor your resume and cover letter to meet their needs. A resume should give off a professional, polished appearance. In your resume and cover letter, show potential employers what you can do for them. To apply for jobs online, you can easily develop an electronic resume and send it to potential employers by email. Use a plain-text version of your resume and paste it into the body of your email after your cover letter or attach a file of your resume to the email and paste your cover letter into the body of the email, explaining that you have enclosed your resume as an attachment. Employers will not automatically throw away your resume if there is even one tiny spelling or grammatical error on it, but make sure to correct your mistake immediately before your next submission. Always try to keep your resume updated. The more current your resume is, the less time you'll have to spend remembering minor details. Check your resume for spelling and grammatical errors before you send it out. If you have information on your resume that gives away personal attributes, it may be in your best interest to exclude it. You do not need to state the phrase "References available upon request" on your resume. It is assumed that you will be able to provide references if asked for them. When deciding how much of your work history to include in your resume, take into account the relevance of each of the positions you have held to the position you are trying to obtain. Some employers who are concerned with what you did more than 10 years ago, so use this as a measure when attempting to condense a lengthy work history. Only use resume-friendly fonts such as Times New Roman, Book Antiqua, or Garamond. Font size should never exceed size 12pt. unless it is for your name at the top of your resume. It should also never get any smaller than 10pt. font. Make sure to put your name and contact information on all pages of your resume and cover letter just in case your pages get separated. The name/information header for your resume should look the same for your cover letter. For your contact information, try to get it all on one line by using abbreviations such as "555.511.1234 (h)" for your home phone number instead of spelling it out. If your resume is two pages, a "Page 2" should be listed at the top of your resume at the other end or below your name (depending if it's off to the right or centered) on the second page. Spacing between lines can be changed. If you need more room, try using a smaller font size such as 6 or 8 between lines. Rethink those margins. A good combination is top and bottom 0.6" with left and right at 0.7." If you need less room, use top and bottom 0.8" with left and right at 0.9." Ensure visual appeal by using design elements with consistency. Avoid tiny fonts and large blocks of text. Do not list salary requirements on your resume or cover letter unless you are instructed to do so. Only add pages of references, publications, or lectures if they are relevant to your job search. If you are an experienced candidate, list your "Education" section after your "Work Experience" section. Do not overuse bold, italic, underlined, and other formatted styles of text. Consider trying to separate your work experience into two sections if you have substantially different types of work, i.e. "Business Experience" and "Educational Experience." If you are applying for financial work, but have relevant retail, educational, and real estate work as well, then try something like "Financial Experience" and "Professional Experience" after. If you have graduated from school in the past three years, list your education at the beginning of your resume. For each job position, make sure that the date of employment and the location of the employer are listed. You can get away with just using years alone, but it would be more forthright to use months and years. If you write that you worked at ABC from 2005-2007 and at XYZ from 2007-Present, some employers might ask themselves (maybe even you) if there was a gap somewhere during 2007. Days are not that important. List as many dates as you can for school activities and professional affiliations. Never write in all capital letters unless it is for your name at the top of your resume. Centering your professional affiliations in their own section can use up "white space" on your resume. For bullet points, try dragging them as far left as you can to put more words on one line. Use sub-bullets to highlight any shining moments of glory during that position. For example, if you work in retail management and one of your duties was to oversee and motivate the staff for sales of a club card for the chain and you proved the highest rate of sales for that card and received a bonus, then you would write that you oversaw sales in a bullet and that you generated the most sales and won a bonus in a sub-bullet. Students should list any relevant coursework down in their "Education" section if they are going into a certain field. Relevant community service should be listed at the bottom of your resume. A profile at the top of your resume can highlight skills and accomplishments if you are an experienced candidate. For each job position, write down as many details as you can and then combine them into important duties to list on your resume. Bullet points are not mandatory on a resume. An "Interests" section on a resume is optional, but is normally not listed on a resume. Some employers might find it interesting that you ski or collect Elvis memorabilia, but others may not-and it could work against you if the employer is a Beatles fan who detests the outdoors. Objectives are no longer listed on resumes, so save your objectives for the cover letter. A "Qualifications Summary" is the same as a "Profile" section. Less is always more, so keep it brief by using simple declarative sentences, strong verbs, and tightly edited writing when listing your job descriptions. Always maintain a marketing mindset when writing your resume. You want to sell yourself to potential employers. When it comes to job titles, it doesn't hurt to be creative but not misleading. If they called you a cashier at work, you can call yourself a customer service representative in the resume. Client liaison specialist might be stretching it. Be bold and use a focused resume for certain fields within your profession that you want to apply to. If you are looking at a corporate environment, focus your resume on your own personal corporate experience. Remember, everyone reads from left to right, so put your most important information first on the left side of the page, such as company names and job titles. Dates and locations should be listed on the right side of the page. Certain professions warrant resumes that should list professional affiliations. If you belong to any, place them. If you are a librarian and a member of the American Library Association, put it on your resume. A chronological resume format contains a list of your positions, starting with the most recent position. If you are in a profession where you have licensure, mention your license information at the top of your resume underneath your contact information. Employers will not take the time to read thick blocks of information, so make it easy on them by using bullet points or lists to separate the information instead. GPA is not always necessary on a resume. However, if you manage to get a high GPA, make sure to post it in your "Education" section. If you've been out of school for more than 10 years, your GPA, extracurricular activities, awards, and courses probably won't be considered that important, and you should use the space instead for your experience. Employers want to see your relevant work history in a reverse chronological format. Never misrepresent yourself on your resume. Lying will always get you into trouble and probably terminated on the spot. A functional resume format markets skills and achievements over job chronology. A resume should achieve a balance of "white space vs. text" that makes it full enough without becoming cluttered. Consider how much weight your profession places on education. For example, legal employers place significant emphasis on education, so make sure that the "Education" section of your resume is clear and prominent. The reader should be able to pick out your job titles, assess your educational background, and get a general sense of the level of your experience after a brief review of your resume. Bullet points can be used with paragraphs to emphasize certain position duties or accomplishments. While job descriptions tell employers who you were in each position, the summary section of your resume allows you to tell employers who you are overall. Accomplishments do play a major role on your resume. Mention them briefly but not at the expense of elongating your resume. Students and recent graduates should write as much as they can in their "Education" section because that is where potential employers will be looking. Bullet points are the quickest way to convey any additional information associated with your education. If you have an extensive list of activities and honors, you may want to create a separate category for each. Listing relevant coursework on your resume can be a good way to compensate for lack of experience in a given practice area. You may have been a member of an organization or activity that is not well known outside of your school or may have won an award for an academic achievement. If you do not provide details about what you did or why you were honored, these things will be irrelevant to a potential employer. If you are listing a fair amount of transactions on your resume, it is better to categorize them by their transaction type. If you are a recent graduate, list your internships in the "Experience" section of your resume because it may be the only experience you have, so expand on those positions in detail. Experienced professionals should list their internships under their "Education" section because it is a great way to display what you did during school without taking up too much room on the resume. Experience never has to come in the form of a paid position, so take into account all of your community and volunteer opportunities, as well as your internships. List your job description duties in order of importance. The most recent position on your resume should have the most detail, while the other positions carry less. When deciding whether or not to include supplemental information, ask yourself how relevant it is to the position you are seeking. Use italics instead of underlining publications or journals for a cleaner resume format. If you have done extensive community work and/or you are planning to pursue a career relating to public interest matters, you will want to focus on your "Volunteer Work" section the most. If you are not currently employed, you resume needs to list the end date of your most recent position. Use action verbs to describe your daily duties. The right verb is always eye-catching. Try not to be repetitive. Using the same adjectives and verbs will make your resume sound boring to potential employers. Also watch that you don't repeat content in your cover letter. If you mention in the opening of your cover letter that you can provide exemplary leadership skills, you don't have to echo that information again anywhere else. Feel free to show that you can lead well-i.e. "I managed a team of more than 20 marketing experts for several lucrative advertising campaigns." Always use 8-1/2-inch x 11-inch white or off-white high-quality paper when printing your resume so that it will be easy to read and scan. Never be afraid to try new outlines and borders for your resume headlines. A curriculum vitae (CV) is not the same as a resume and usually runs much longer. List your work number on your resume if your search is not confidential and your employer has no policy against acceptance of personal telephone calls. Give outdated experience a feeling of real time by using past progressive tenses such as "I was managing" to draw readers away from the past tense of the experience in your cover letter. Using acronyms is fine, but make sure to write out the abbreviation the first time it appears in your document. An example would be "American Disabilities Act (ADA)." From then on, you can just use "ADA." Never use contractions on your resume or cover letter. You can save a lot of space by collecting minor duties under one bullet. For example, if you are business manager and your duties were primarily overseeing operations, consulting for business development, and marketing strategy, but you also managed the staff, conducted research, and wrote letters to clients, you can place the first three in separate bullets if there is a lot of detail involved and place the last three with periods or semicolons by one bullet: "Managed staff; conducted research; wrote client letters." Not every resume has to be in the traditional format. A functional format can be useful for experienced candidates. Or a hybrid of chronological and functional can be created. A functional resume lists all duties performed for all relevant positions in the candidate's career history. Then the places where the candidate worked is listed below in a "Work History" section. When to use a functional resume: There is not right or wrong when deciding to go with the traditional chronological resume or a function one or a hybrid of both. However, functional resumes tend to be ideal for candidates who are trying to play up or downplay certain details of their resumes such as big gaps in work history, no direct experience, or returning to a certain field of employment after a lengthy absence in another. If you've been traveling the world for five years but are a whiz at biochemical engineering, a functional resume will play up all your great biochemical engineering experience by putting that first, then downplay the five-year gap in your work history by putting your work history below it. If you have a JD and an MBA and you were an attorney, then became a businessman, but now want to go back into tort litigation, then a functional resume will play up all your previous legal experience by putting that at the top, followed by your relevant business experience below (if necessary-it doesn't even have to be there), and work history below that. If you got your JD recently, but have 10 years of business experience before that, you can play up your leadership, client relations, and analytical skills up front before going into your non-legal work history. Interviews can teach you about the effectiveness of your resume and cover letter. 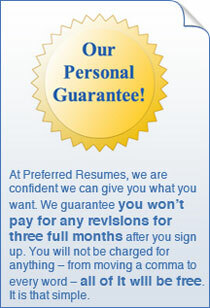 Use Preferred Resumes to write a professional resume and cover letter for you.